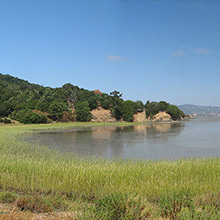 Marin County is famously known as the birthplace of mountain biking. In this beautiful corner of the North Bay, you’ll find biking trails that helped define a sport that’s now enjoyed globally. Haley Grialou is currently studying Communications and Marketing at the University of San Diego. Before you head out on the trails, you’re going to need some wheels. If you’re visiting from out of town, or just looking to try before you buy, there are good equipment rental places in Novato, including Old Town Sports. Situated in downtown Novato, OTS has been open since 1978 and is the go-to destination for ski and snowboard rentals in the area. They also carry bikes, and recommend that you call ahead to see what’s in stock. You can also start your ride with a visit to Bicycle Brüstop, another locally-owned Novato business. No rentals here, but if you’re looking to upgrade your gear or buy your first mountain bike, they’re here to help. 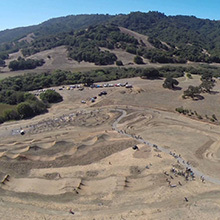 As the name suggests, Stafford Lake Bike Park was built by bikers—the nonprofit organization, The Friends of Stafford Lake Bike Park—for bikers. This action-packed bike park is 17 acres and is perfect for bike riders of all ages to enjoy. Bringing the park into existence was a real community effort and the bike park’s popularity has continued to grow since its opening in 2015. Within the park you’ll find a single track loop trail, gravity fed flow trails with jumps and berms, pump tracks, north shore style trails designed after the trails at Tahoe’s north shore, and a dual slalom course. There’s also a separate area for kids to learn to ride and become more comfortable on a bike. China Camp is my one of my favorite locations in Marin for mountain biking. It’s my go-to destination for introducing friends to the sport, as it offers a good beginner/intermediate trail, with great views of the Bay. After all, mountain biking isn’t just about conquering the most challenging trails. Sometimes it’s just a good way to enjoy nature and get a little exercise in the process. Generally, the trails are smooth and don’t require as much technique as other trails in Marin County. 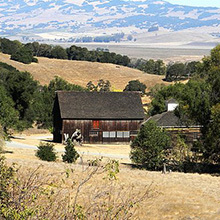 Mount Burdell is a local Novato favorite, known for beautiful views of the entire Bay Area. The mountain is covered in oak and bay trees, and is teeming with wildlife. During the spring, there are spots where vibrant wildflowers bring extra color to your biking adventure. Cyclists also frequent Hidden Lake, which is a seasonal pond located almost halfway to the summit. The ride starts off relatively smooth and stays at a comfortable grade, but as you continue up, it gets steeper and rougher. If you enter the trail from San Marin, it’s about a 7.2 mile ride. The trail is very well marked and there are many different outlets leading to the main track. This is definitely a trail for more experienced mountain bikers seeking a steep challenge. After a long day biking in the hills of Marin County, I love is nothing more than relaxing and enjoying a refreshing drink and something to eat at the Wildfox Restaurant in Novato. 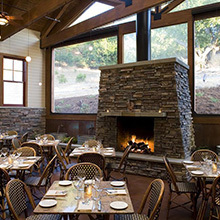 One of many great places to eat in Novato, the Wildfox is a personal favorite, with an upscale-rustic feel. While you rest up from your ride, you can glimpse the sprawling hillsides right outside the windows. They have an extensive wine list and packed bar, and their outdoor patio is a perfect place to eat on a warm summer night. Wildfox serves American comfort food, specializing in grilled chops, steaks, burgers, fish, and my personal favorite, the risotto.Their wood burning oven produces some mouth watering pizzas as well.